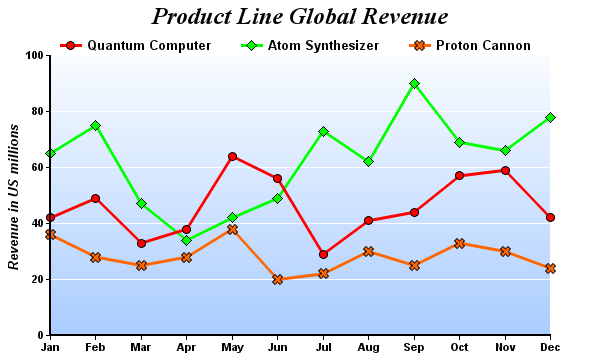 A multi-line chart with square and diamond symbols as data points. Data labels on top of the data points. The title bar background is actually a 1 x 2 pixels wallpaper pattern. A nicely designed line chart. Dual titles on top and bottom of chart. Also, a custom text label in the top right corner of the plot area. A chart to demonstrate 3D line styles. Despite being small, this chart has complete features. Easy to include in any web page layout. Ideal for mobile devices with small screen size. A line chart using different symbols for the data points. 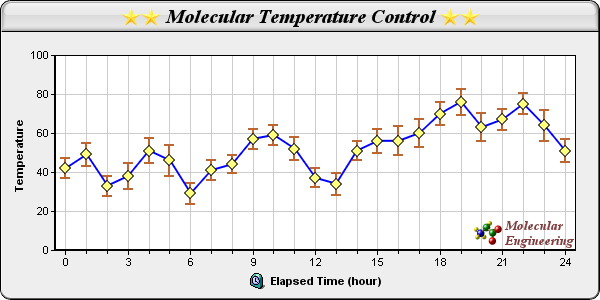 A multi-line chart with user-define custom symbols. A line chart with 2 layers - a line layer for the line, and a box-whisker layer for the error symbols. 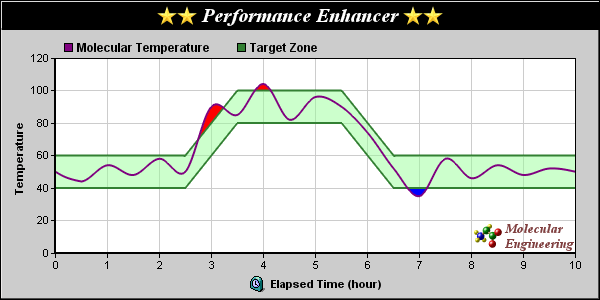 This chart demonstrates the power of ChartDirector's layering architecture. It allows one to combine arbitrary layers to create new chart styles using existing layer styles as building blocks. 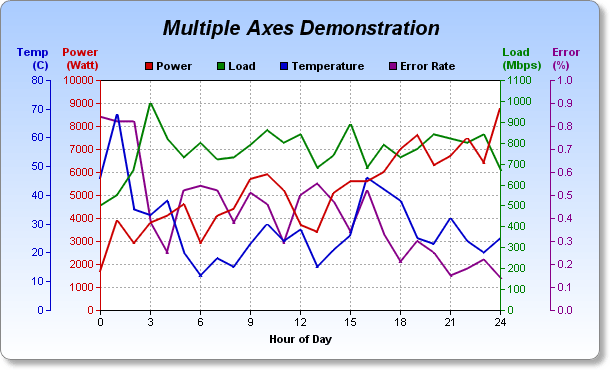 ChartDirector supports arbitrary number of axes per chart. This example demontrates using 4 independent y-axes. This chart actually consists of a spline layer, a line layer, and three inter-line filling layers. ChartDirector allows you to fill the region between two lines (which can be straight lines, spline lines, step lines, trend lines, mark lines). The fill colors can be different depending on which line is on top.